$244.99 Where does this come from? 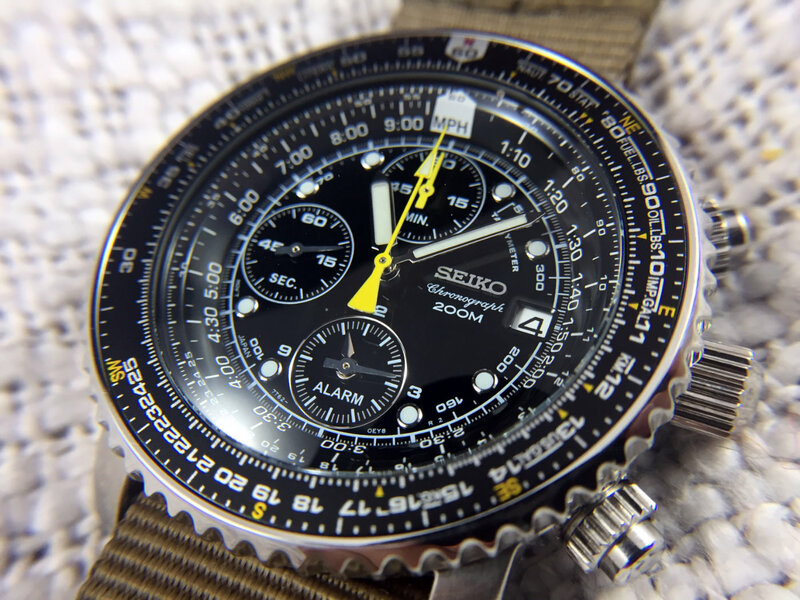 The Seiko “Flightmaster” SNA411 is an affordable quartz chronograph designed specifically for pilots and engineers. 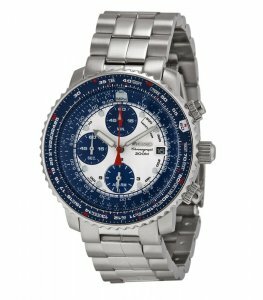 With it’s built in rotary slide-rule, 60-minute chronograph, and analog alarm function, the SNA411 makes an excellent choice for those looking for a low-maintenance and feature-packed watch for flying or traveling. Featuring a rotary “flight computer”, the watch’s bezel is a brilliant adaptation of the standard slide-rule, a mathematical apparatus used throughout history by scientists and engineers to design “virtually everything”, including building rockets and sending astronauts to the moon. 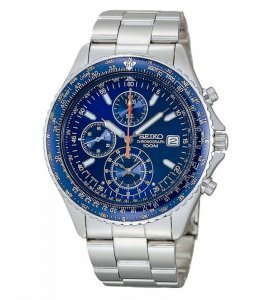 Although not the first to utilize it, Seiko has executed it well on this model. The slide-rule can perform an incredible amount of mathematical operations – from basic math to unit conversions, but does take some practice to operate. Although the death of the slide-rule was swift with the invention of the digital pocket calculator in the 70’s, the charming appeal of this now-defunct mechanical calculator is hard to deny. 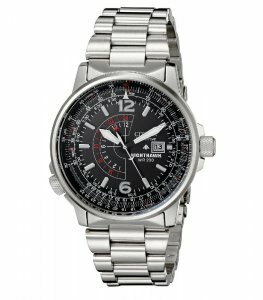 Combined with the chronograph, alarm, and 200M of water resistance, the Flightmaster is an incredibly attractive sports watch for fans of the flight chronograph style. If you’re interested in the slide rule and chronograph features, but don’t need the alarm function, check out this review of the Seiko Flightmaster SND225P1 by Cameron at WYCA. The Seiko “Flightmaster” is a 42mm watch that wears much smaller than it’s specs would suggest. 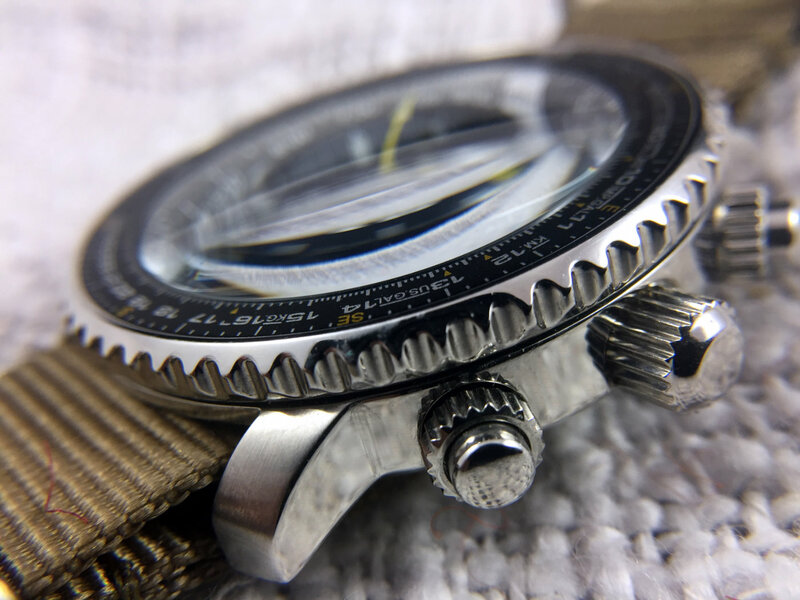 The bezel and slide rule use up quite a bit of visual space, leaving only 32mm for the actual watch face. Combined with the short lug distance of 44mm, the watch wears more like a 40mm watch than a 42mm watch. 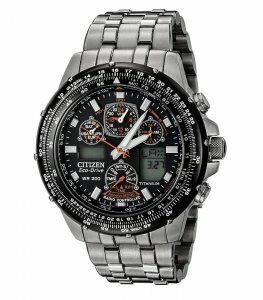 With that said, I feel it’s a very comfortable size for most people, and those looking for a larger watch in this price range might want to consider the Citizen Nighthawk. Of course, the iconic Breitling Navitimer would also be a suitable alternative, just be prepared to empty your wallet. The case design is basic, yet robust: a simple polished cylindrical barrel with short straight lugs and a radially brushed case-back encircle a black chronograph dial. 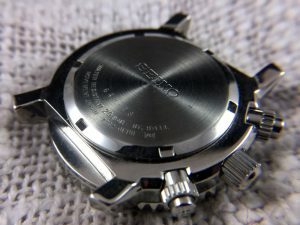 Protruding from the right side of the case is the crown and chronograph pushers, featuring a unique screw-down design that allows the the buttons to be locked in either an open or closed position. The bezel has a grippy sawtooth edge and smooth bi-directional action, making adjustments and calculations a snap. 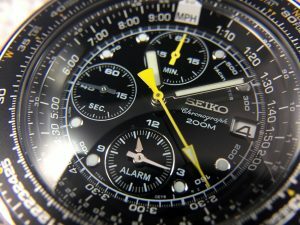 The dial on this Seiko is intense. The combination of raised and reflective surfaces, a slightly-domed crystal, and a moving cluster of sub-dials make the dial very interesting to look at. The watch is also a bit more “sparkly” than pictures would suggest, making it an appropriate choice for business or formal wear. The bright yellow chronograph hand ties in the yellow markings, giving it a sporty touch that supports it’s 200M water resistance. The internal bezel is sloped, enhancing readability and lending a bit more visual interest. The steel bracelet included with this watch leans towards the dressy side of the spectrum – with polished center links matching the case and setting off some of the other reflective elements on the dial. One little issue: because of the shape of the lugs and thickness of the spring-bars, fitting a NATO strap can be a bit of a challenge. Instead of slipping the strap underneath the spring-bars, you’ll have to remove them completely and fit them over the strap. A work-around for this would be to replace the fat spring-bars for something more standard, which would allow the NATO to slip underneath much easier. 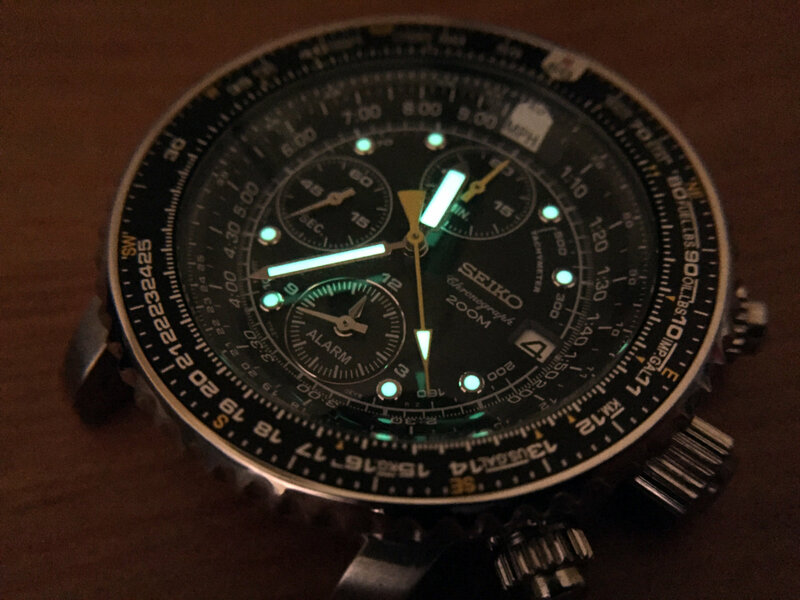 Lume is strong, par for the course with Seiko, but there are only eight luminous markers on the dial. The hands themselves are also lumed, in addition to the tip of the chronograph. The sub-dials and bezel are un-lumed, but its unlikely you’d be able to use any of these features in the dark anyway. Overall, it’s a solid design that balances functionality and readability, although those with poor eyesight will have little chance of being able to read the small type. 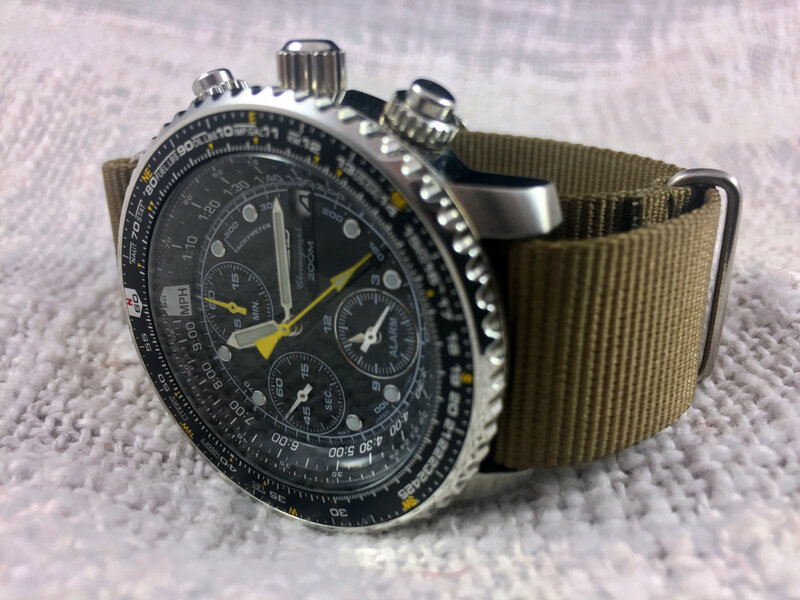 And although it is bit impractical, the calculation bezels give the watch a very tactical look that is a lot of fun to wear. 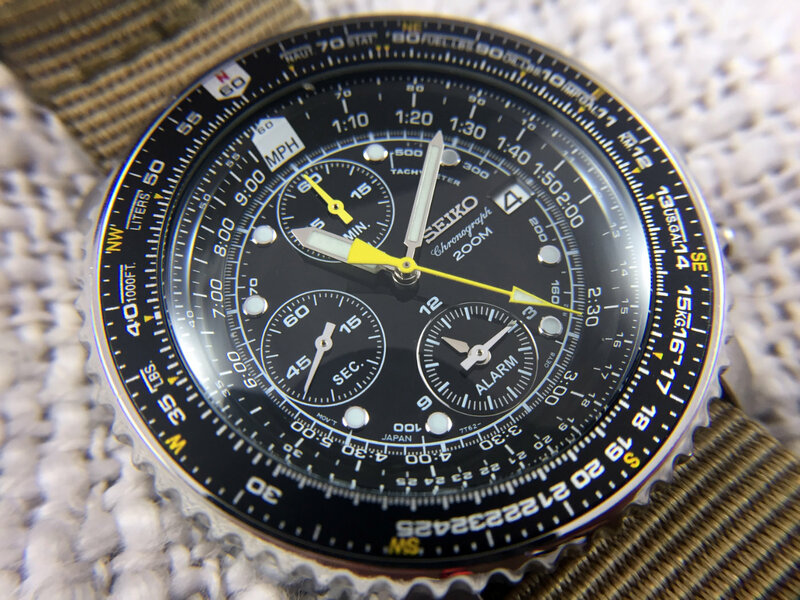 The Seiko “Flightmaster” features a useful 60-minute chronograph with the addition of a “flight alarm”, a sub-dial that can also be used as an additional timezone (see also: Tooling Around the World: Top 5 Best Travel Watches). The flight alarm is a 12-hour alarm, but it can be used as a wake-up alarm as long as it’s set properly. The alarm itself is an audible “beep”, similar to what you’d get from a digital Casio. It doesn’t vibrate or snooze, and the alarm is silenced with a simple click of the pusher. The main chronograph itself sweeps across the dial at 5-clicks per second, giving it a smooth and accurate motion. One of my favorite features of this chronograph is the way the chronograph and sub-dials reset. Sounds strange, I know – but the way the hands all sweep around the dial in a precise and synchronized fashion is simply mesmerizing. Setting the alarm is also quite fun, watching as the rotating sub-dial picks up speed as you hold down the pusher is something you won’t see from any purely mechanical movement. Before the advent of computers, watches with slide-rules used to be standard equipment for commercial and military pilots. Yet today, very few commercial pilots use a watch like this for it’s intended purpose. Still, these watches are very popular for a lot of the same reason Seiko dive watches are – a timeless design, useful for a variety of tasks, and a quality/value combination that is hard to match. It’s a rather complicated system to use in the real world, but with a little practice it can be incredibly handy. Learning to use a slide rule will be included in a future blog post, but for now I will just reference the dry-yet-informative official Seiko Instruction Manual. 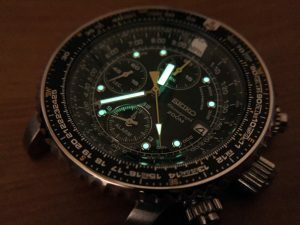 The Seiko “Flightmaster” is an excellent choice for those looking to purchase an affordable quartz flight chronograph. 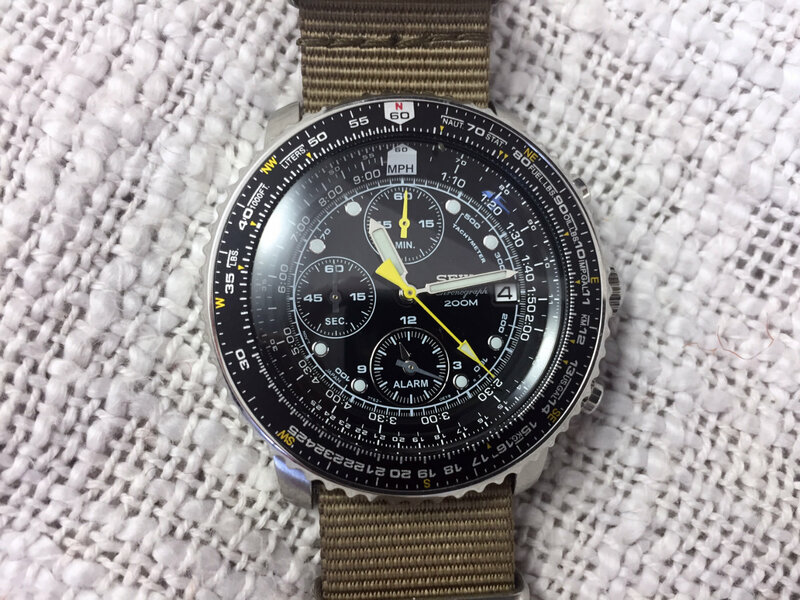 Although most people will stick to the basic chronograph and alarm features, the mechanical novelty of the slide-rule bezel is fun to play with and master. And with the known history and quality of Seiko, you know you’ll have a piece that will last for years to come. 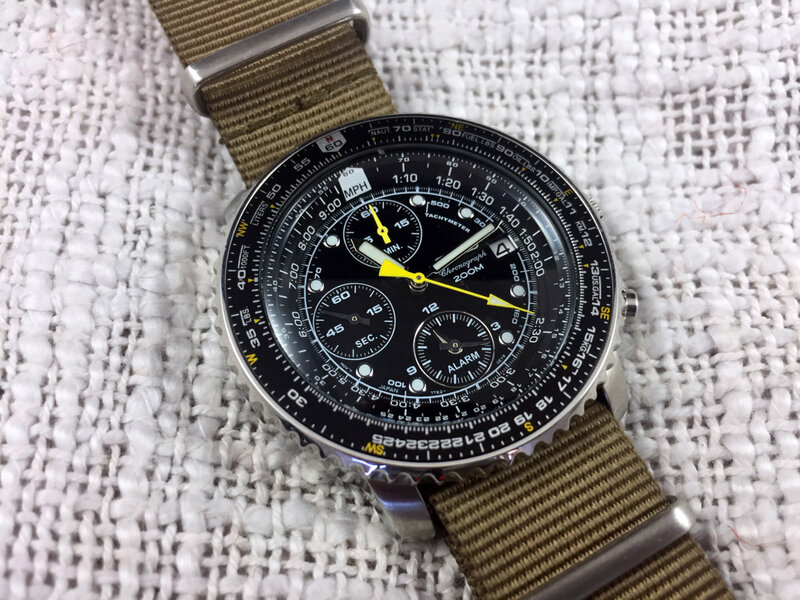 Do you own a Seiko Flightmaster? Let us know your thoughts in the comments below. Just curious what size Nato do you use on yours? 20mm, 21mm?? It’s a 20mm strap… the gap is barely noticeable. 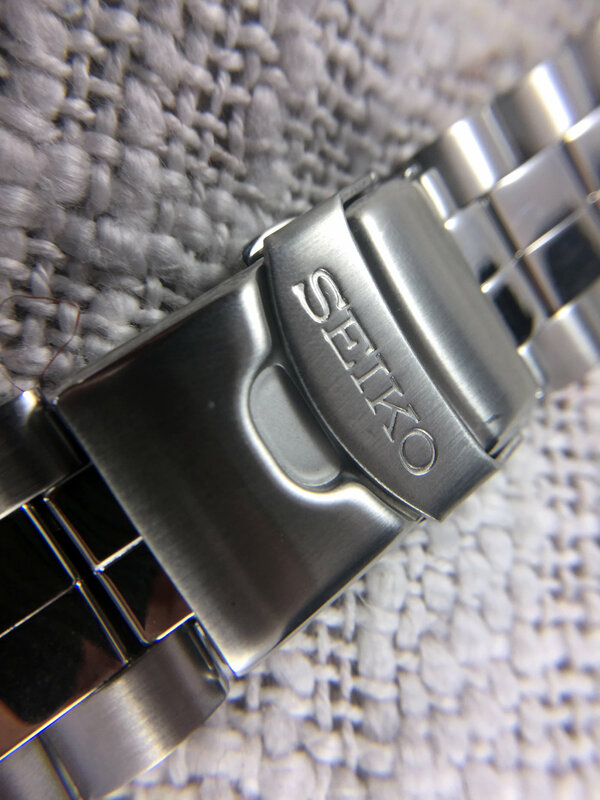 I do wonder why Seiko chose such a strange lug width size though. I had this timepiece for about seven months, and I love it. I used a NATO strap during the summer (I’m in the southern hemisphere) and you are right, it’s not so easy to attach. I changed the springs but one of them came loose so I returned to the original ones. Reatacching the original strap is very difficult. I am slightly skinny so this face size fits my wrist perfectly. I have a couple of digital chronographs (and a Tag Heuer mechanical one) and I always receive compliments for this one. 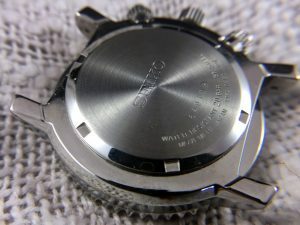 As expected with Seiko, the build quality and durability are top-notch. After some heavy use, it doesn’t even have the slightest scratch. 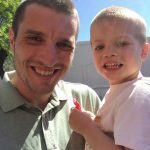 Hi, great review of a great watch! can’t find it for that price in stock. where did you get yours? 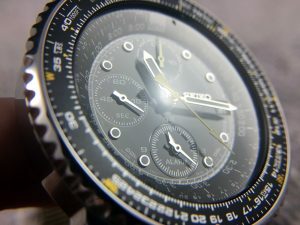 Hey Francisco — it looks like the watch has become quite popular and the prices have gone up since I published this review. I bought mine on Amazon but they appear to be completely sold out. Keep checking though, because they come up every so often. You could also create an alert on WatchPatrol (https://www.watchpatrol.net/?query=SNA411) to let you know when a used one hits the forums. no point franco new ones will cost north of 450 US$ atleast. Sadly enough I didnt get it. That price of $210 was fake to get attention to his amazon market. He then asked $400 :(. Hey Russel, I believe it’s a crown and buckle premium khaki NATO (http://www.crownandbuckle.com/khaki-premium-nato-22mm.html). They don’t have 21mm though, so you’d have to get the 20mm (there is a small gap). Hi! Your watches serial is a 64xxxx. I noticed that you posted this last year, 2016. Do you think your watch was produced April of 2016 or 2006? I believe this has been discontinued already but there are still a number of ebay sellers with this item with serial numbers starting with 6 and 7. I’m just anxious if their items are made 2006/2007 or 2016/2017 (which means the items are the last in the production dates).